Coming into work today (walking into the home office room) there were ants at my office desk, behind my keyboard. I don't really eat in front of the computer, so I'm not sure what was attracting them. I had seen one or two before, but now there was an entire trail. I cut open a liquid bait trap that they are supposed to walk in and carry the poison back to the colony. A few minutes later the I noticed the poison had leaked onto my desk forming a dark brown gooey puddle. Turns out it's just Borax so it's not going to kill me. Tons of ants started to show up. I've been watching them all day. It is completely unrelated of course but funny that last night I got about four hours of sleep. It has completely energized me. My mood, outlook, and concentration are much improved. I'm singing songs and didn't lie down at lunch. I'm getting work done (and only taking a small break to write this post). Accomplishing more today than I have all week in fact. So maybe the way my brain is working I'm seeing meaning in things that are insignificant. I began to wonder what ants mean. Quick Google search for ant symbolism found this, this about ants in the Bible and Quran, and this about Dali and ants. Not sure I want to go with any of that symbolism. At this point it's interesting and coincidental in a silly way that ants don't really sleep much but instead take lots of small micro naps throughout the day. Here I am running on more of a nap than a full night's rest. 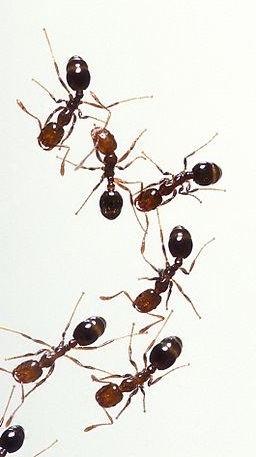 The other thing I'm going to count as significantly silly is that ants are productive. They get the work done. Hopefully it's a sign I'm going to get more and more work done as the days progress. That hopefully things are turning around.